Over 25 years experience decorating and designing cakes for all occasions! 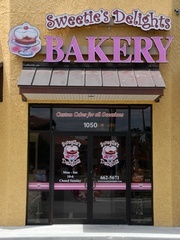 We are located at 1050 Bloomingdale Ave in Valrico, FL in the Plaza Bella Shopping Center. Open Tuesday-Friday from 10 am to 6 pm and Saturday 10 am - 5 pm. Closed on Sunday and Monday. Sweetie's Delights specializes in custom cake designs for all occasions. Each morning we stock our showcases with unique gourmet cupcakes, brownies, bars, cookies made with the highest quality ingredients right here in our kitchen. Please call early to place your cake order. See you at Sweetie's Delights Bakery soon!! !